Studies have found that the stomachs of a captured wild discus fish contain small shrimp, insects and insect larvae, small fish and fair amounts of plant material. When discus fish eat, they appear to mouth the food and spit it out before recapturing it and swallowing it. The reason for this is their teeth, or lack of teeth. Discus fish do not have teeth, but rather grinders in the jaw. The scientific name ”symphysodon” means jaw grinders. So when the discus fish is eating, food is taken into the mouth, ground up and spit out, then picked up again for regrinding before swallowing. During this process, many food particles fall to the bottom of the discus fish aquarium. Discus fish will expel water at foods resting on the aquarium bottom, then pick them up as they float. Discus fish are poor predators and many baby guppies have grown to maturity in a discus aquarium. This behavior in feeding discus fish indicates a discus fish diet consisting primarily of nonmotile worms, crustaceans and insect larvae. Studies done on commercial fish show different needs for carnivores versus herbivores, fresh versus marine and cold versus warm water fish. By comparing the requirements of fresh water carnivores, which live in a warm environment, we should be able formulate a complete discus fish diet. 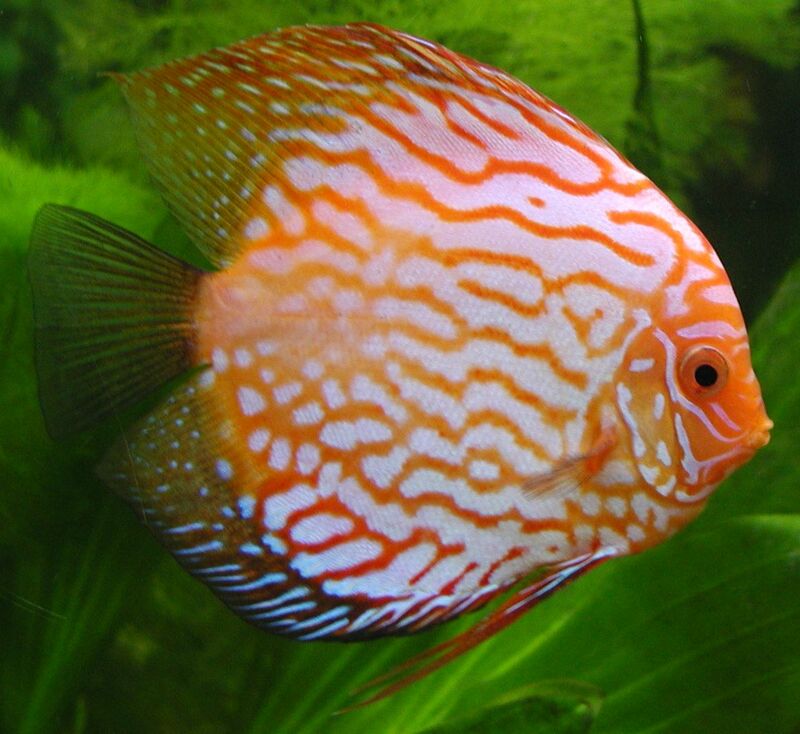 Published accounts of discus fish care by various discus breeders tells us that discus are very flexible in their dietary preferences regarding their discus fish diet. Some discus fish breeders feed single source foods such as brine shrimp, beef heart or bloodworms. Other discus fish breeders feed live foods. The average discus fish breeder uses a combination of frozen foods and dry foods. Discus fish need a minimum of 40-45% protein in their diet. Discus fry would benefit from a minimum of 55% protein in their diet. Discus fish can utilize both saturated and unsaturated fats as energy. Fat supplementation at 20% of the discus diet is tolerated as long as sufficient essential fatty acids (1-2%) are supplied. Simple carbohydrates such as sugars are probably utilized but the more complex starches are poorly digested. Because discus are a soft water fish (water low in minerals), a calcium/phosphorus ratio of 1:35 should be supplied in the discus fish diet. An important consideration in formulating the discus fish diet should be variety. While discus may live and even reproduce on a non-varied diet, the deficiencies that occur may account for vague problems such as slow growth and outbreaks of disease. Any live food added to the discus fish diet carries an element of risk with it. Some discus breeders feed a diet that consists of only beef heart. A varied discus fish diet can meet dietary requirements using a combination of commercial discus fish foods. Live, frozen or a homemade frozen discus fish food containing the proper ingredients should be utilized in the discus fish diet. Posted in Discus and tagged aquarium, breeders, breeding, diet, discus, discus fish diet, fish, frozen, heart, help, tips.